Alan Bulmer sent me some more interesting fishing from New Zealand last week so, in the absence of any sea angling by me (soon I hope!!!!!! ), here it is. We motored down to Whangamata on Friday night to do a few jobs on the dinghy and fish the Saturday morning and evening low tides. The day dawned with clear blue skies and a decent smattering of cotton wool clouds. There were intermittent gusts of wind from the South East interspersed with calm periods. As I trudged across the mudflats at 6.45 am the noise of cicadas chirruping from the forest on the other side of the estuary was already in full swing. Low tide was scheduled for 7.00 am and, as expected, it had already turned when I reached the shoreline. For a change, I had decided to fish the first couple of hours of the making tide to see if anything was feeding and there was always the consolation of the run down to low tide in the early evening if nothing eventuated. As I neared the channel I noticed that there was a flurry of activity where one of the side streams entered the main body of the estuary. It looked like Kahawai and they were feeding abnormally aggressively. The splashy, swirling rises were explosive and looked like someone was punching the water upwards from well below the surface. First cast with an Orange sassy shad and I was hooked up to a small feisty Kahawai of around 12”. The Kahawai fought in short bursts and did not jump as I was fighting it using side strain only. The shoal continued to harass prey while I landed and released the Kahawai. Two casts later I was into another Kahawai that felt bigger than the first. It charged around in the shallow water but again did not jump and was drawn steadily to the shore under constant side strain. Despite the more aggressive fight, it was only a mirror image of the first fish and was quickly released to fight again. By now, the feeding shoal had sounded. I continued to pepper the area with casts but gave up after half an hour of fruitless casting. I decided next to see if I could catch a snapper and worked my way up the estuary casting the soft plastic as close as I could to the moored boats. Nothing happened for some time and all the while the incoming tide was slowly starting to gather momentum. A horse mussel then decided that it had a more pressing claim on my lure so I was forced to re-rig, this time with a pearl / black Sassy shad. It was time to change tactics. I started to fish the soft plastic as if it was a wet fly and cast across and down. 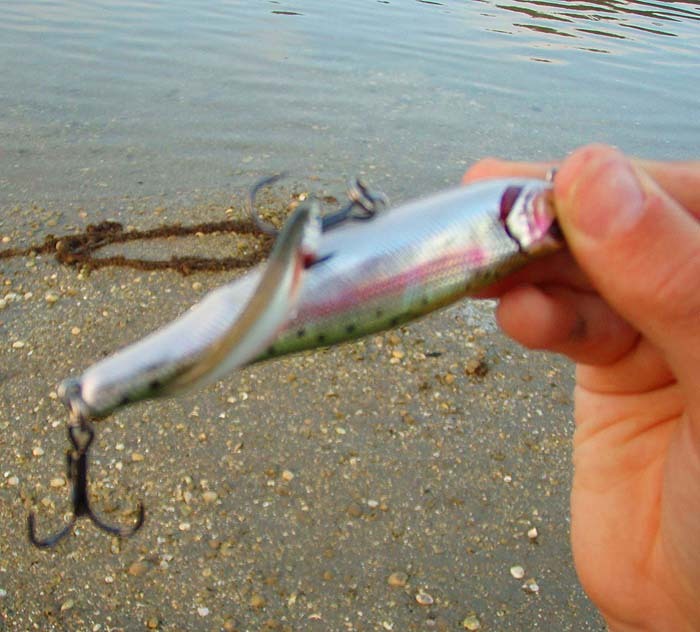 By casting straight out it was possible to use the current to slowly drift the lure in an arc to the shore on a tight line. Almost instantly I started to get bites and judging by the rows of teeth marks tattooing the lure they were from snapper. Then the inevitable happened. 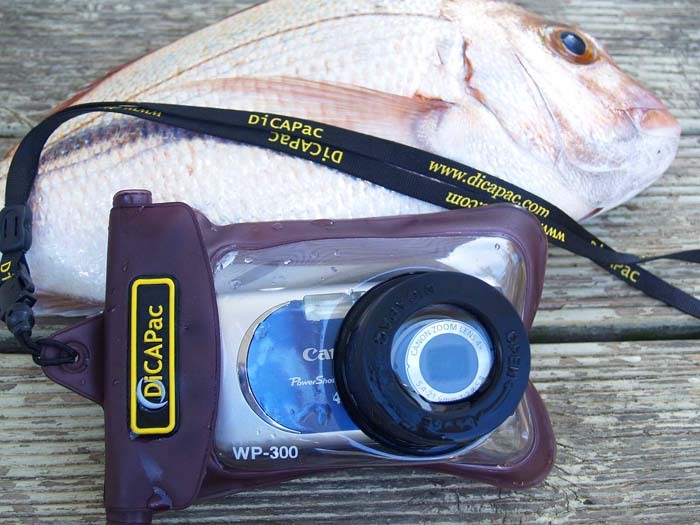 A snapper slammed the lure and headed off in a long run into deeper water. The dogged head shaking gave it away. It took a while to regain the lost line and almost as soon as I did it steamed back off again. Slowly I managed to work it into the shallows and finally beach it. It was only ~ 1 kilogram (32 cm) but was in very good condition so I decided to ask it home for breakfast. The tide was moving more quickly now so I continued to fish with it up the estuary. I had a couple more savage takes, one of which nipped the tail clean off the lure, but was unable to hook up again. As I moved away from the original scene of the action the bites stopped completely. In hindsight, it appears that the snapper may be holding under the boats which have horse mussels growing on the sea floor beneath them and that clear, sandy bottoms are mostly devoid of fish. 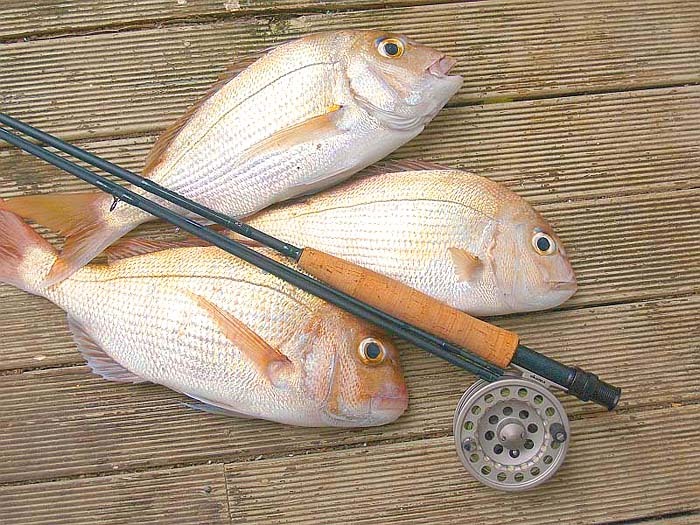 If you are not snagging on the bottom regularly then the chances of hooking up on a snapper are dramatically reduced. I eventually called it a day at 8.30 am and went home to pan fry my prize! After breakfast I started work on the aluminium dinghy. The aim was to fit some more rod holders so that nothing got damaged in transit. 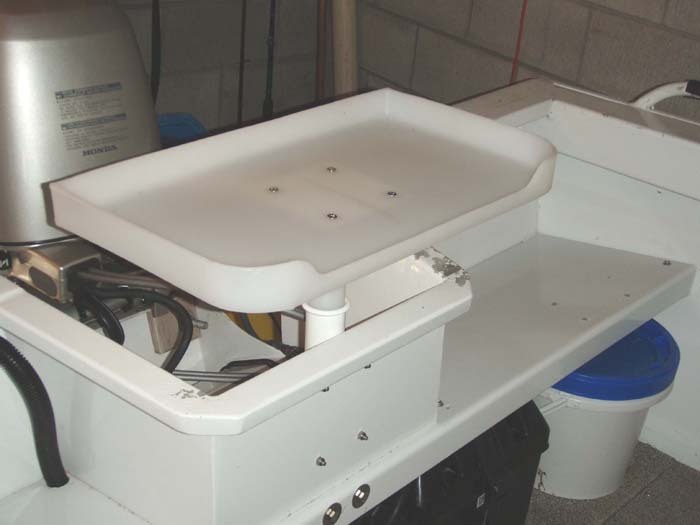 I purchased a three-in-one plastic rod holder from Cabela’s and had decided to fit this on the forward port side, just behind the foredeck (see attached photograph). 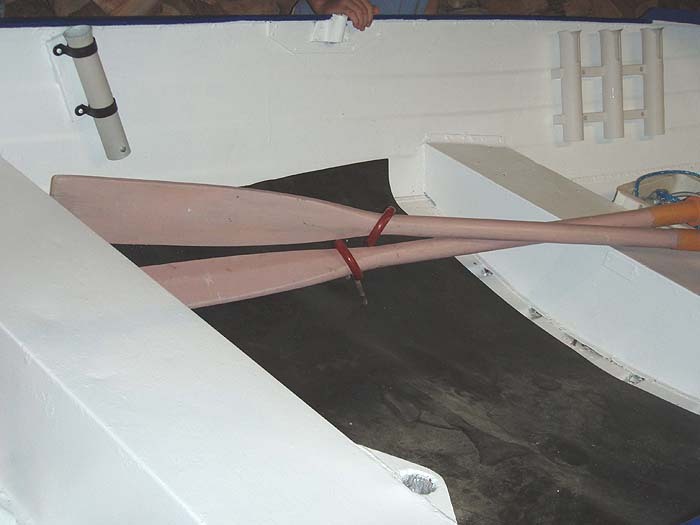 A singe rod holder was fitted in the middle of each stern quarter and the final rod holder was mounted on the starboard side of the transom towards amidships. It took until lunchtime to complete this task due to a couple of interruptions from Ivan’s fishing colleagues. Bill MacDonald (of Gulp! soaking fame), saw my car and dropped in with some Albacore Tuna for dinner. He had landed a 14 kilogram fish on 5 kilogram line and thought that we would appreciate a taste. It was delicious when coated in cracked pepper and seared briefly on each side in a hot pan. Tim decided that he would accompany me on the evening session. There is nothing like success to get the troops mobilised and ready for action! We set off immediately after dinner in the muggy, still twilight and started fishing at 7.00 pm. As we neared the main channel the Kahawai shoal showed and started to harass prey in the same spot as earlier in the day. The explosive rises were identical as they punched up through the surface film on their prey from below. Tim could hardly control his excitement so I decided not to start fishing and offer assistance. With me providing instructions he calmed down and started methodically flicking his soft plastic jig in amongst the Kahawai. He persisted for 10 minutes and did not get a touch. Next Tim tried an L-minnow and after a similar period gave that up. I suggested that he try a popper and tied on a 4” Yo-Zuri Tail dancer. He had never used a popper before and the first few casts were sprayed in all directions. Seagulls that were minding their own business upstream and downstream were suddenly an endangered species and took to the air squawking in protest. Slowly Tim started to get the hang of it and mastered the fast retrieve, stop, fast retrieve action. Next up he foul hooked a bait fish and followed that up with a foul hooked 14” Kahawai (see attached). Consequently Tim is now nicknamed “Vlad the Impaler”. This particular popper holds vertically when the retrieve is stopped and I think that the Kahawai may have slashed at the paused lure while on the surface and hooked itself in the region of the pectoral fins. It fought doggedly but did not pull large amounts of line from the reel. The school kept on rising for another 15 minutes but Tim did not hook up again and gave up to collect a feed of Pipis for his grandfather. I started fishing beneath the moored boats when Tim put his rod down but mentally kicked myself for not taking a fly rod as the Kahawai would probably have been a sitter for an Eddystone eel on a floating line. Once again I started to get snapper bites over the mussel beds with across and down retrieves when the tide started to run. Despite a couple of savage pulls and numerous fish leaving a multitude of teeth marks all over the soft plastic I could not stay attached. 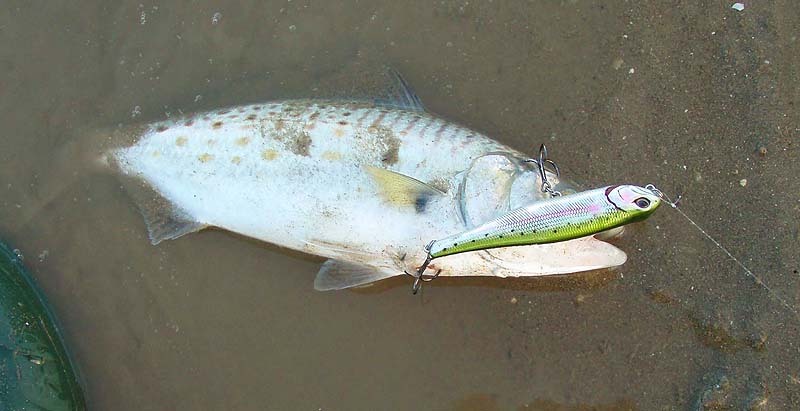 One fish smacked the lure powerfully and headed off for deeper water. I instinctively raised the rod vertically only for the hook to pull almost immediately. If I had played the fish with side strain the result may have been different but it was not to be. By now it was almost dark so we packed up and headed home from a most entertaining hour and a half. "Progressed from a seven weight to a five weight rod." and has been "Having a lot of fun just wading the local sand banks. Using a WF5F, a 9ft level leader of 10lb mono and some lightly weighted flies that consist of little more than a copper wire body and some sparkly wing material." It looks like fantastic sport to me. Mark has also got himself a waterproof camera case so picture taking is now less hazardous for the kit. 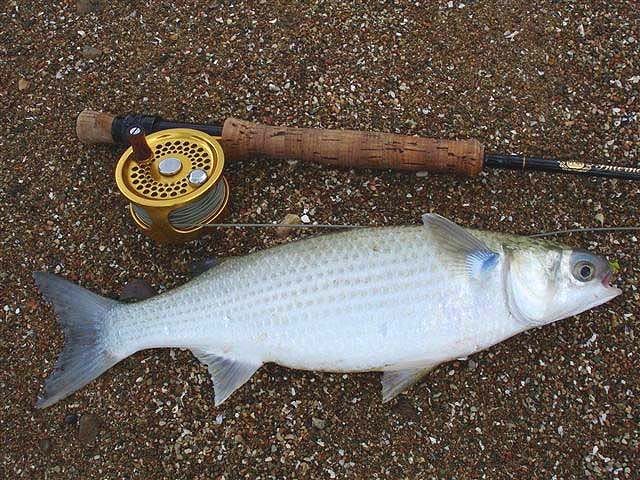 He's also intending to target the local mullet with his fly gear and sent a nice picture of one caught recently by his pal Craig Worthington - it all takes me back to my first attempts at Purbeck mullet - Those were the days. It's a small world.